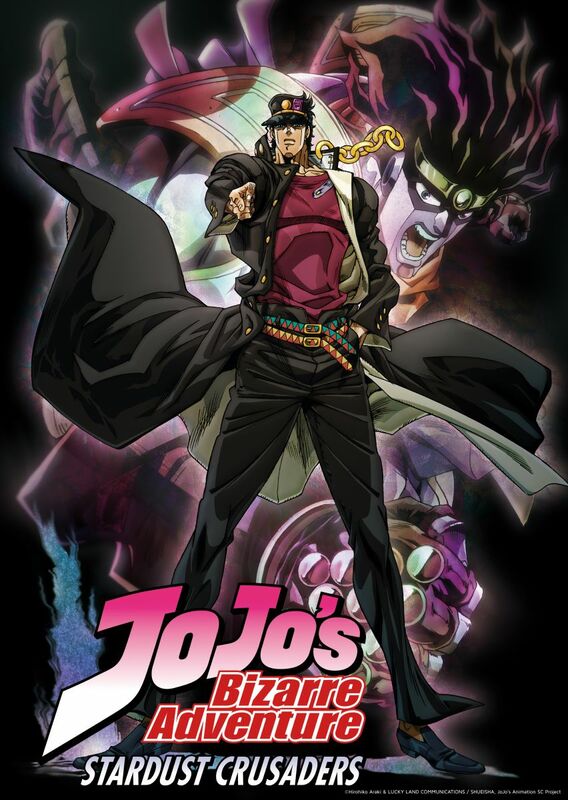 Jojo’s Bizarre Adventure: Stardust Crusaders is the follow-up season to the original Jojo’s Bizarre Adventure. Releasing in April of 2014, Stardust Crusaders introduces Joutarou Kuujou, who is NOT your everyday typical Japanese high schooler; in fact, he may be the furthest thing from it. He begins his story locked up in a jail cell demanding not to be set free, the reason being is that he believes he has been possessed by a spirit, and not the friendly variety. Joutarou’s mother, Holly contacts her father, Joseph Joestar (the main Jojo from part 2) out of concern for her son. Joseph agrees to travel to Japan to attempt to convince Joutarou to leave his cell. When Joseph arrives, he goes to meet Joutarou and attempt to explain the situation behind the “spirit”, explaining that Joutarou is not in fact possessed by a spirit, but rather that the spirit is the manifestation of his fighting spirit. Reluctant to believe such a theory Joutarou remains defiant but when one of Josephs friends, Mohammed Avodl forces Joutarou into a fight, he is forced out of his cell. It is soon after this encounter that Holly begins to manifest her own stand, however, her peaceful nature prevents her from being able to control it and as such she falls terminally ill with little more than 50 days to survive. And so Joutarou, Joseph, and their new companions set out to save Holly, to do so the group must track down and defeat the believed dead Lord Dio Brando, an immortal vampire with terrifying power. The band must travel half the world across to the city of Cairo in Egypt. However, it will not be smooth sailing as Dio has employed the aid of many other villainous Stand users who are set on preventing the group from reaching Dio. As I previously stated Stardust Crusaders introduces the concept of “Stands”, deciding to chuck Harmon out the window altogether (pretty much). Stands are described as the physical embodiment of one fighting spirit and can take many different forms such as a giant fire chicken, zombie fog, and even just a gun, however, most people think of Jotarou’s iconic Star Platinum, the purple punching ghost. It is really these stands that make JJBA so Bizarre in the first place. The abilities (while nowhere near as outlandish as later parts) are very unusual. Much like the previous season of JJBA, we see the continuation of the resplendent art style which I thought was used to even greater extent than before, really changing bringing deeper contrast to the events and never failing to capture my interest. Stardust Crusaders (Part 3) is arguably the most popular part of the JJBA series and the favorite part for many fans, but I would have to disagree. I very much enjoyed part three but I found that after the point where the group leaves Singapore, the show very much becomes a “villain of the week” scenario with two episodes per enemy and this format continues right up until the end of this season. I just found that this format was too repetitive and dragged out the fights much more than was needed. When I read the manga I found that this problem wasn’t present because I was able to read through the parts much faster and so the fights never seem to outstay their welcome. I think that this is just a result of the conversion of manga to anime. I rate this anime 7.5/10.